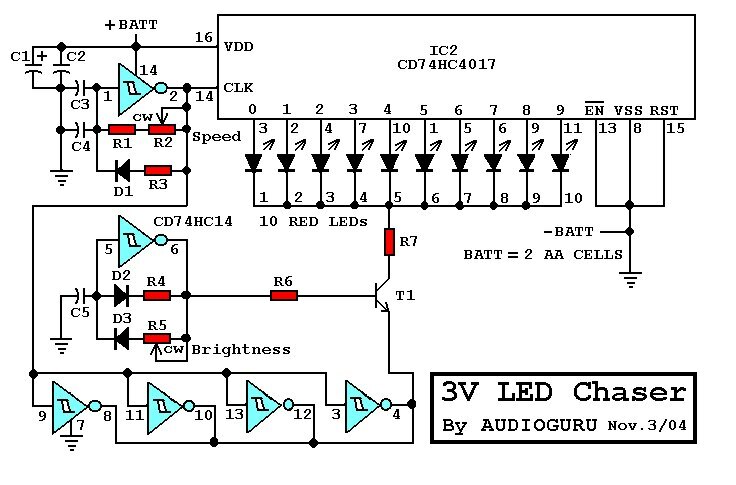 There are many 9V chaser circuits that seem to waste about 7V when driving LEDs that are only about 2V. This project is unique, because it uses only two inexpensive alkaline battery cells totaling 3V for power. Since most of the waste is eliminated, the cells last a long time. Unlike the other circuits, this one flashes the LEDs for only about 30ms each, further extending the battery life. For user convenience, it has a stepper speed control and a brightness control. At slower speeds and with reduced brightness, the battery life is further extended considerably. Mounted in a circle, the LEDs appear to rotate as they step from one to the next. 2.0V, LEDs reach almost full brightness, battery replacement is recommended. The 74HC Cmos ICs are rated for a 2V to 6V power supply for high-speed logic circuits. They continue to operate at a much lower voltage but no longer meet high-speed logic specifications. To reach high speeds, their output current can momentarily exceed 400mA (low voltage drop) but thermal considerations limit maximum continuous output current to 20mA. Perfect for driving LEDs! вЂў IC2 is a 10 stage Johnson counter/decoder. On the rising edge of each clock pulse its outputs step one-at-a-time. It drives the anode of each conducting LED toward the positive supply. вЂў IC1a is a standard Cmos inverter Schmitt-trigger oscillator with C3 and C4 totaling 800nF for a very slow step rate. R2 is the speed control pot with R1 limiting its maximum speed. It clocks IC2 and feeds the inverters/drivers. D1 and R3 reduce its output high time to 30mS. вЂў IC1d, IC1e, IC1f and IC1b are paralleled inverter/drivers for a low output voltage drop and drive the emitter of T1 to ground. вЂў IC1c is another standard Cmos inverter Schmitt-trigger oscillator. R5 is its Pulse Width Modulation control and with D3 performs dimming of the LEDs. D2 and R4 extend the PWMвЂ™s maximum pulse width. вЂў T1 is a transistor that is used as a PWM switch. R7 limits maximum LED pulse current. вЂў C1 bypasses the batteryвЂ™s supply voltage at low frequencies and C2 bypasses at high frequencies. 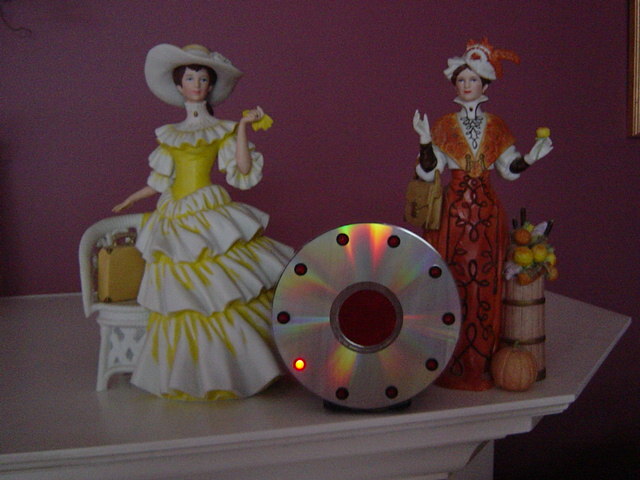 The ten LEDs mount on a Compact-Disc which is glued to a plastic box with contact cement. The box houses the Veroboard circuit in its lower main part with the battery holder in its lid. Multiconductor ribbon cable joins the LEDs to the circuit. The pots mount on the sides of the box. 1) The ICs are manufactured by Texas Instruments, and others. 2) The LEDs are manufactured by Fairchild Semiconductor. 3) Above manufacturers offer free samples.